On 6 November 2002 HM The Queen officially inaugurated the Memorial Gates on Constitution Hill in London, UK. 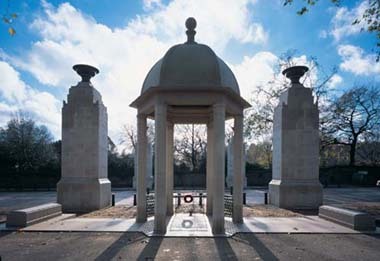 These Gates have been erected as a lasting memorial to honour the five million men and women from the Indian subcontinent, Africa and the Caribbean who volunteered to serve with the Armed Forces during the First and Second World Wars. They also celebrate the contribution that these men and women and their descendants, members of the Commonwealth family, continue to make to the rich diversity of British society. To find out more about the contribution of those honoured by the Memorial Gates, please click on the icons to the left or use the search above. Best viewed at 800 x 600 screen size or higher. Web Site by TecNet Software Services Ltd.